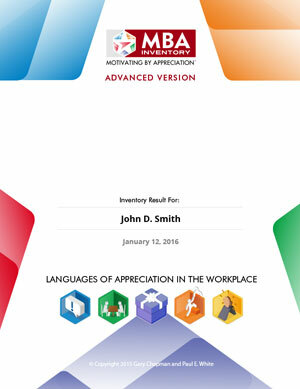 This is much like the initial version of the MBAI – it identifies the individual’s Primary Language of Appreciation, their Secondary Language of Appreciation, and their Least Valued Language of Appreciation. Additionally, the respondent then chooses the acts of appreciation they prefer in their Primary Language of Appreciation and from whom they desire those actions (e.g. supervisor, colleagues.) The report is concise and to the point. the ability to report individual’s and work group results to employers and provide group statistics, including groups according to age range, and industry (optional, but only available with Advanced or Premiere MBAI’s). Using the Advanced MBA Inventory as the starting point, the Premiere version is for large organizations (e.g. corporations, government agencies) who want to customize the inventory to their employees and work settings. Options include creating unique action items, incorporating the organization’s logo, mission statement, core values in the report, and creating customized demographic categories (location, divisions) for segmenting results. 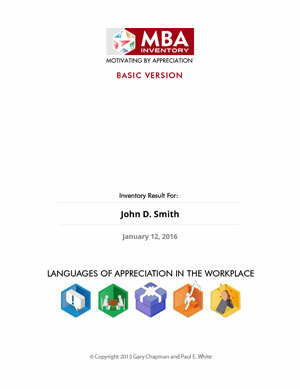 For each of these specific work setting versions, the action items for group members’ setting have been customized to reflect the unique aspects of these workplaces. Additionally, each specific work setting versions is available in both the Basic MBA Inventory and the Advanced MBA Inventory versions. Create and manage subgroup results. We now provide each individual taking the MBA Inventory (regardless of the version they choose) to be able to share their MBAI results with their friends, family and colleagues via Twitter and Facebook. Additionally, we have made the MBA Inventory website mobile friendly.